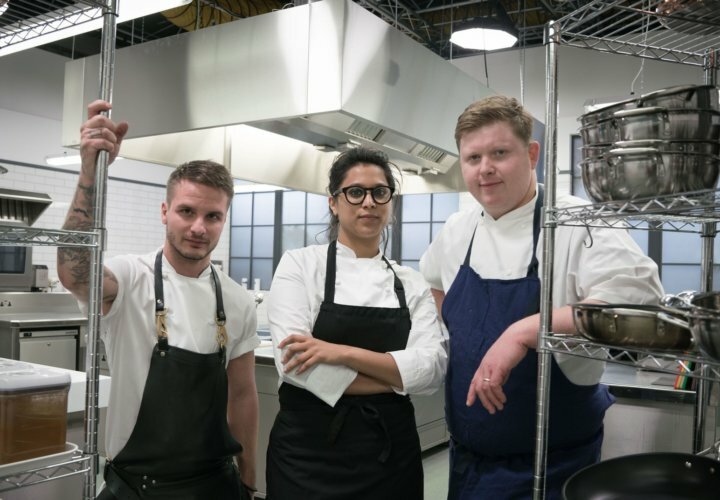 Great British Menu (GBM) returned to our screens on 20th March 2019 for series 14. The BBC Two show puts the nation’s most talented chefs to the test. At Women in the Food Industry we are interviewing the strong female line-up of chefs from across Britain competing to serve their dish at the final banquet. Our co-founder, Mecca Ibrahim, interviewed Sabrina Gidda, Executive Chef at Allbright who is representing the Central region starting 3rd April 2019 on the show. How did you get onto Great British Menu? As you know I was on Great British Menu last year so I was really thrilled when they asked me to do it again, as I had such fun last year. How did you start working in restaurants and where did you train to be a chef? It’s a super eclectic journey for me as I have had no formal training as such. My degree is in fashion and PR and marketing. I only really cook because I just love it. I started in gastro-pubs and a lovely man called Charlie McVeigh gave me my first opportunity to be running a kitchen at a very young age. Prior to that I ran a lovely antipodean cafe in South West London for a chap called Mike Daniels who just allowed me to cook. The journey’s been quite varied since. The marketing side has been really useful since working at Allbright as food runs throughout so much of what Allbright are doing – the Academy, working breakfasts, events etc. Talking about the Roux Scholarship, you’re the only woman to have got through to the finals twice, what was that experience like? My other half says I should have done it for a third time, but by then I was already a head chef at a restaurant, Bernardi’s, so I was already living my dream. The people I met and networks I made, despite not winning were amazing. So I ‘ve achieved many of the things I wanted to achieve. This year I’ve seen Olivia Burt go through and it’s wonderful. You have to be calm in that competition and it’s all about your talent and execution on the day. I overran by 45 minutes in my practising but on the actual day of the regionals I was five minutes early! How did you prepare for the music theme at GBM and what approach do you take? I would be lost without my headphones and we are not without music at home. It’s a great theme and gives you quite a broad brief. Doing the show the second time round, you see that some people like the gimics and the props and take the brief very literally. I don’t have too many gimics and props. But my food is still served on plates though and not on records! I took a very personal approach and music to me is about memories and people. Tell us more about your relationship with music? Everyone has that song that takes you back to a place and one of my courses takes me back to the time when I first started collecting vinyl. There is something magical about the physical thing of picking up an original vinyl record from the sixties, but you are listening to it in a completely different time. We always grew up listening to vinyl like Bob Marley, Motown, Stevie Wonder and UB40. Then there was all of the Punjabi music. So it was really great to explore that. This year you are competing with two male chefs for your region. Last year in your region there was only one man in your round, have you found the dynamics any different? Not really both Ryan Simpson from Orwells Restaurant and Kray Treadwell of The Man Behind the Curtain are such lovely chaps. They were both really gracious. I was with Ryan before in Great British Menu last year so loved cooking with him again. It was all great fun. We’re all cooking, we’re all in the same boat. We’re all trying to do the best we can and we just get on with things, so gender doesn’t become a thing. Which course do you think you “smashed” and which course gave you the most problems? The fish course went really well and well, with the starter course, without giving too much away I had a bit of an equipment crisis. I was worried about my main course as it meant so much to me so I wanted to do really well at it. If you were marooned on a desert island, what was the one type of dish you could happily live on? That’s such a hard question for someone that’s so greedy. Dim Sum as I am obsessed with Asian food. Finally, what one piece of advice would you give to anyone who wanted to be in your position, getting to the Roux Scholarship finals, being an executive chef yourself and appearing on Great British Menu for a second time? It’s important to be really driven and really focused. But also talk, network and pick up the phone. Be brave, people value bravery and you will surprised about how many people in top positions like receiving letters or approaches from those starting out. Be confident and enjoy the journey. There will always be testing times along the way, so go for it! Sabrina will be appearing on Great British Menu from Wednesday 3rd April representing the Central region. If you think you have what it takes to be on TV in a food show, discover what TV producers are looking for in our feature – 7 things you always wanted to know about being on TV in the food world!